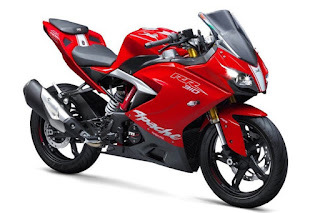 TVS launched Apache RR 310 in India with 2,27,870/-* on road price. TVS has come up with new RR Series: APACHE RR 310.On 6th December 2017 TVS India launched its new flagship bike Apache RR 310 in India with a price range of 2.02 lac (ex-showroom Delhi). Apache RR 310 will compete with KTM RC, Honda CBR 250R, and Yamaha R3.Pre-booking for apache RR310 Will start by end of this month.As er the performance perspective apache RR 310 doing really well on track, it accelerates from 0-100 in 7.1 sec and can go up to 160 kmph.The new model gets Upside Down Front Forks, Anti-Lock Braking System and Electronic Fuel Injection as standard.Some more detailed Specifications are given below. It has 4 strokes and 4 valve single cylinder,liquid cooled engine.Displacement is 312.2 CC.Apache RR 310 gives a maximum power of 25KW@9700 RPM(34 PS@9700 RPM) and peak torque of 27.3 NM@7700 RPM.It has dynamically controlled integrated high energy ignition system.Power to weight ratio of RR310 is 0.147 KW/KG.Clutch system of Apache RR 310 is wet multi 8-plate.This model has 6-speed gearbox. Apache RR 310 has a good seat height of 810 MM and ground clearance of 180 MM which is good for bad Indian roads or bumps.Whereas wheelbase is 1365 MM which helps the rider to take corning confidently. Apache has 11 liters of the fuel tank which is enough for the city and touring perspective.Riding range is 300-330 KM which is more than adequate. In city Apache, RR 310 gives around 25 kmpl and on the highway, it gives around 30 kmpl.Which is good as compare to its rivals like KTM duke/RC. it has Trellis frame and split chassis.the front suspension of Apache RR 310 is inverted cartridge telescopic fork and rear suspension is two arm aluminum die-cast swingarm.it has advanced monotube floating piston gas assisted shock absorber. Front wheel size of this bike is 110/70 r-17 tubeless tyre and rear tyre size is 150/60 r17 tubeless tyre.Stock tyre quality is amazing in apache RR 310.It has Advanced alloy wheels for better performance. Brakes are very important for a Sports bike and here apache RR 310 has 300 MM petal disk break with ABS in front and 240 MM disk break with ABS At the back. This bike weighs around 169.5 kg and maximum payload is 130 kg. 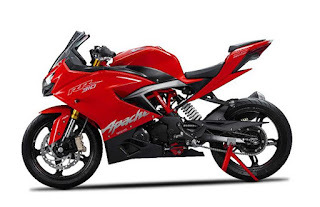 Performace of this bike is amazing it can go 46 kmph in just 2 seconds.Apache RR goes from 0 kilometers to 100 kilometers in just 7.17 seconds and 0-60 in 2.93 seconds. 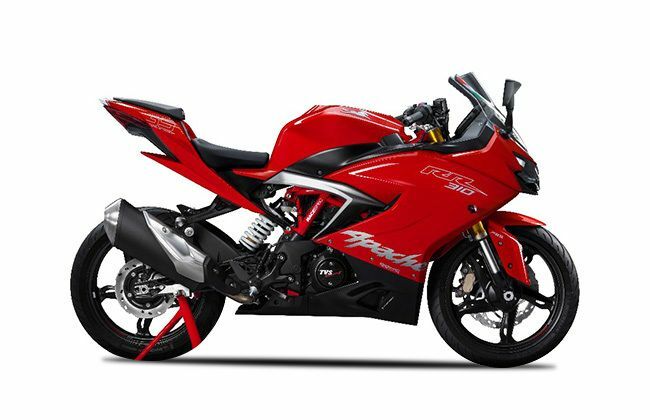 AS per company TVS claimed Apache RR 310 can go up to 160 Kmph. The LED taillamp is amazing at night, along with the yellow LED indicators, give a very premium look to the motorcycle. 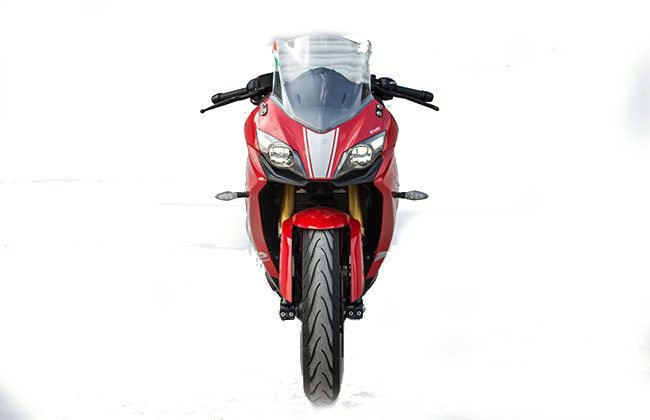 Some part of the TVS Apache RR 310 comes from the BMW G310R. The raised clip-on make the bike more performance-focused. The bike will get tyres from Michelin. Other features of the bike include split seats, a digital speedo console, a sculpted fuel tank and disc brakes at both the ends. The riding position is sporty yet comfortable for long drive. Also, the large windshield will protect the rider from the windblast. Finally, the projector headlamps should offer decent light in the dark. The motorcycle comes in 2 colors – Red and Black. Apache RR310 will cost around 2,02,000/- (ex-showroom Delhi) and 2,27,783/- on road Price.Although Price may vary from state to state. TVS has done a marvelous job the new Apache RR310 is Amazing Entry level Sports bike.It will compete with KTM RC 390 and other 300 cc motorcycle in the market.Price of Apache RR 310 is worth of its value.Let see how it will perform on India roads.